Kofi Annan and his twin sister were born into a family of gold merchants in what would later become Ghana. His uncle and both his grandfathers had been tribal chiefs, and his father was Regional Minister (governor) of Ghana's Ashanti province. As a boy he was sent to elite private boarding schools, and as a young man he studied economics and management at the University of Science and Technology in Kumasi, Macalester College in St. Paul, Minnesota, the Institut universitaire des hautes études internationales in Geneva, and the Massachusetts Institute of Technology. 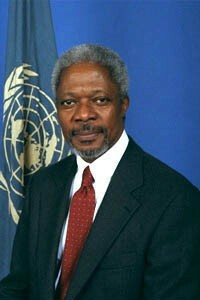 A lifelong U.N. bureaucrat, Annan started working for the U.N. while studying in Geneva in 1962. Early on, he famously wrote that he'd be running this organization one day. For the next few decades, Annan took on a variety of U.N. assignments involving budget and finance and such, in Ethiopia, Egypt, Switzerland and the U.S. In the wake of the Iraq-Kuwait-USA war, he was sent to negotiate the release of hostages, the quick exit of half a million stranded Asian workers, and the sale of humanitarian supplies to Iraq. He was Under-Secretary General under Boutros Boutros-Ghali when he got the big gig in 1997, becoming the first black U.N. Secretary General.